13 -Karen Kerschen - Blooming brambles, 14 x 18 in., oil, Ojo Caliente, NM. 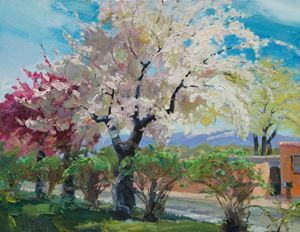 24 -Lee MacLeod Spring On Paseo Peralta, 6"x8", oil. Location,Santa Fe.